Find out what your default time zone affects and learn how to change it. The time zone you select in your Account Settings affects your daily budgets and custom schedules for Push campaigns. Data tables and charts are also based on your account's time zone setting. To change your time zone in Account Settings, follow the below steps. 1. 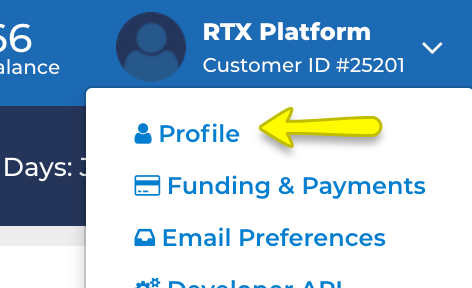 Log into RTX Platform. 2. Click the dropdown icon next to your name and customer ID # at the upper-right of the screen. Select Profile. 3. Scroll to the bottom of the page. Under "Reporting Preferences" you will see a setting called "Default Time Zone." Click the dropdown and choose select either UTC, US/Eastern, or US/Pacific as your time zone. 4. After you choose your default time zone, click UPDATE PROFILE to apply your selection.